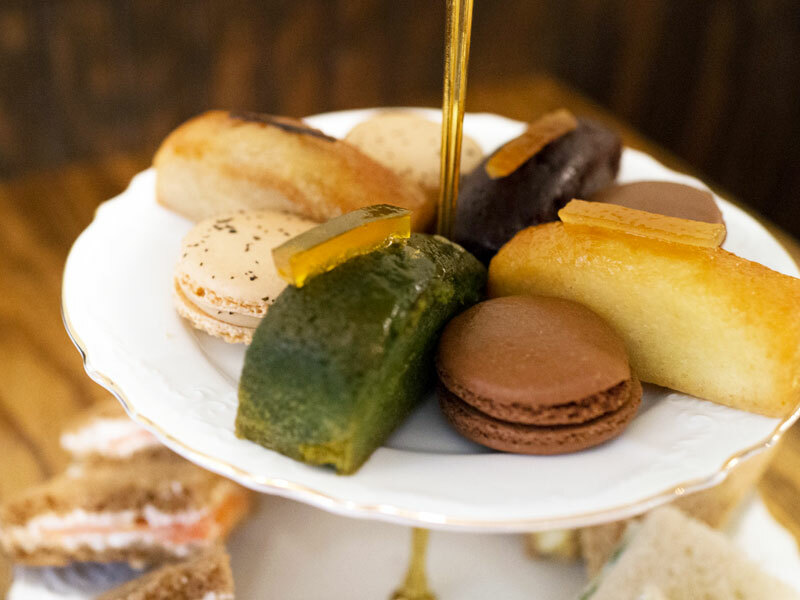 Located in the West Village, Bosie Tea Parlor has the best priced afternoon tea at $34 for one person and at $66 ($33 each) for tea service for two. The seating is a little tight with the tables close to one another but it’s manageable. It’s not a place I would come for an intimate private conversation but it’s great to catch up with friends over a three-tiered tray full of food. Bosie’s cafe so they have other food options aside from afternoon tea and they have an extensive tea menu. Everything is very casual here including the decor. It’s nothing fancy but they do try to make things cute, which I appreciate. 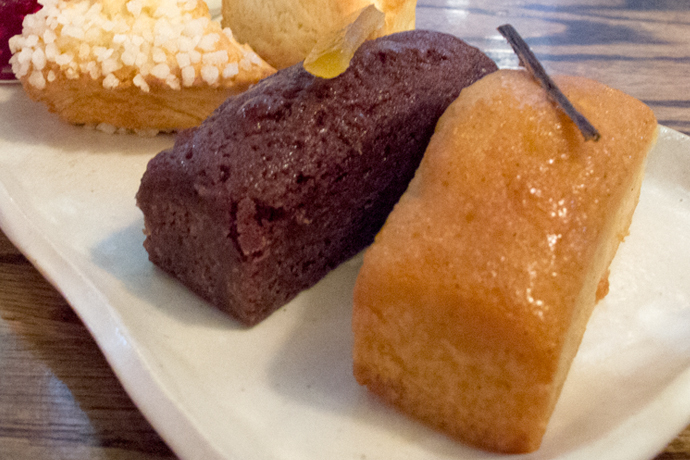 Bosie offers three different afternoon tea options. The first option is the Bosie Tea Service. 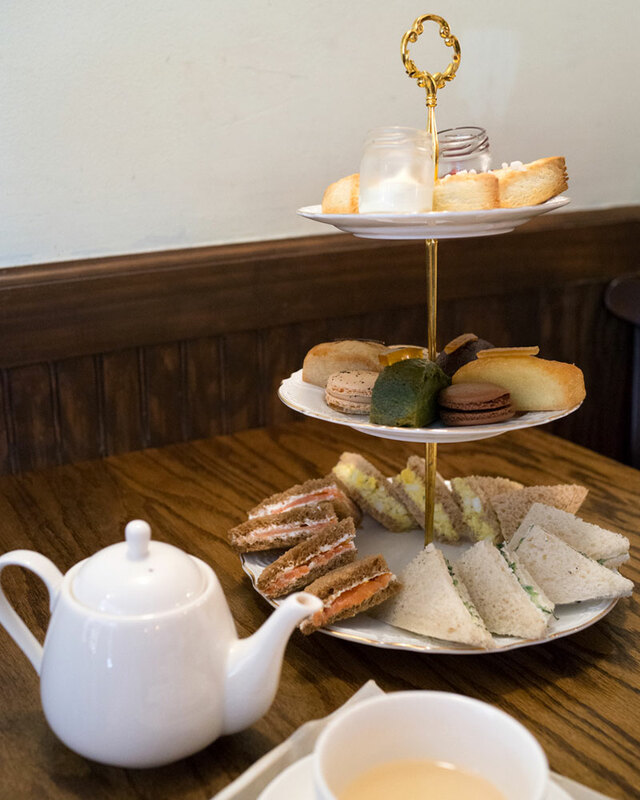 There’s the Bosie Tea Service for One at $34 and Bosie Tea Service for Two at $66. I always get the Bosie Tea Service for Two. Each person gets a pot of tea, two mini scones with clotted cream and jam, three tea sandwiches (you can pick the three), two mini tea cakes, and a macaron. The second option is the Champagne Tea Service. For one, it’s $49 and for two people, it’s $95 ($47.50 per person). This is pretty much the same as the Bosie Tea Service but you get a glass of Champagne and instead of tea cakes, you can choose any pastry from the display case. The third option is the Chef’s Tea Service and it’s priced for two people at $120 ($60 per person). You need to reserve at least 48 hours in advance. 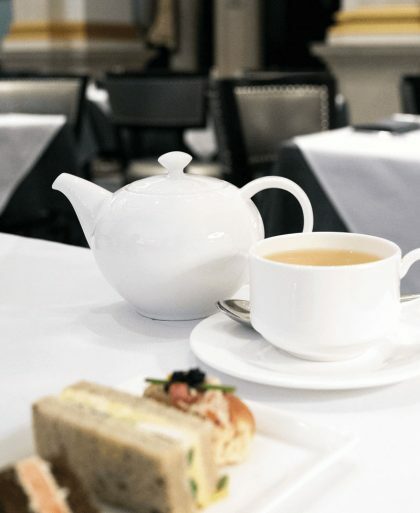 The Chef’s Tea Service comes with Champagne, premium tea, upgraded savories like black truffle and duck breast, mini scones, pastries from the display case, tea cakes, and macarons. Do I Need to Make a Reservation for Afternoon Tea at Bosie Tea Parlor? Bosie doesn’t take reservations for parties with less than six people so this can lead to a wait since everyone’s a walk-in. The only other time you can make a reservation is if you’re getting the Chef’s Tea Service. What Do I Wear for Tea at Bosie? It’s super casual so there is no dress code and you can wear whatever you want. 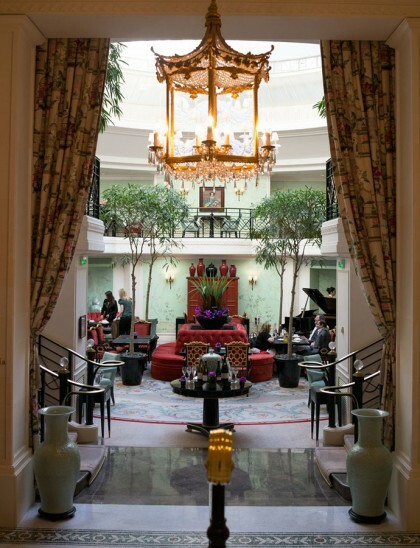 What Time is Afternoon Tea at the Bosie? 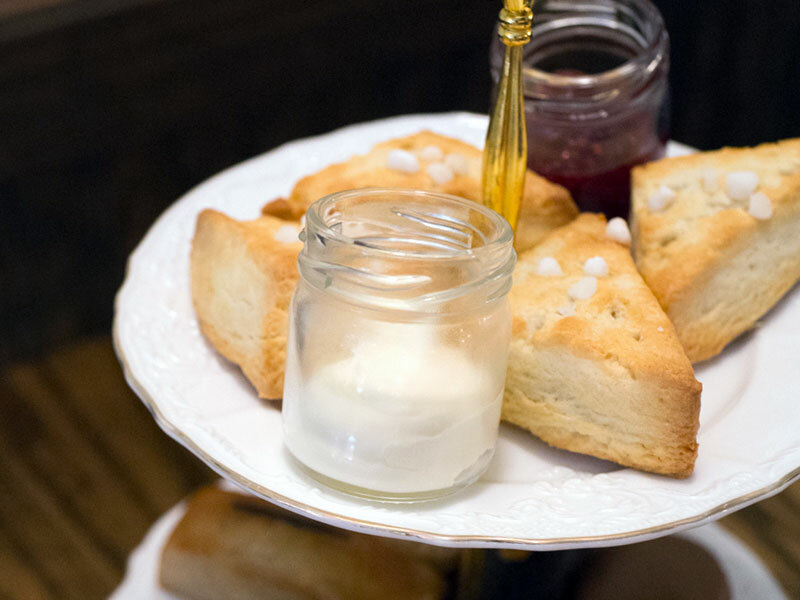 Bosie serves afternoon tea all day! Only a couple of other places (Crosby Street Hotel and The Whitby) does this. 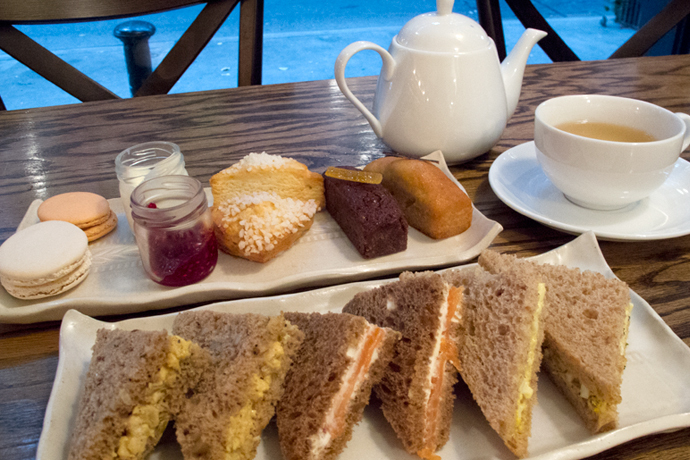 How Long is Afternoon Tea at Bosie? 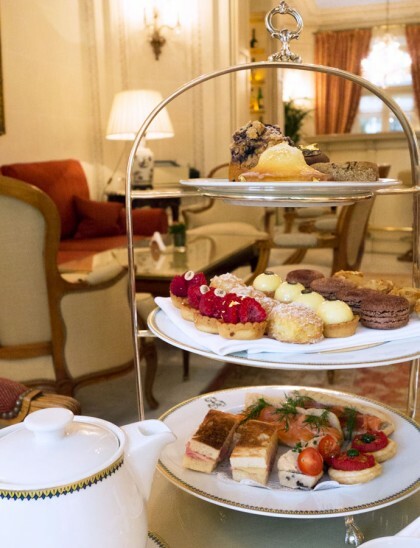 Afternoon tea at fancy hotels usually last about two hours but since Bosie is casual, afternoon tea here takes about an hour to an hour and a half since there’s less frills and fuss. 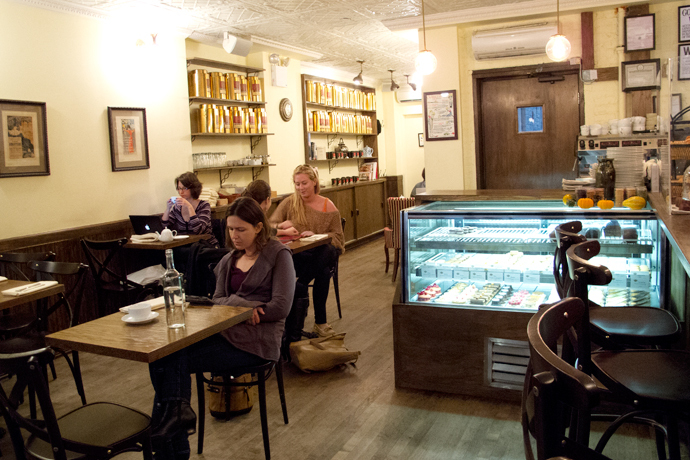 Bosie is a cute place with wooden tables and chairs but definitely not opulent like hotel afternoon tea spots. It’s simple and no frills. The tables are a little too close together and it gets noisy in there so it’s not good for quiet conversations. The service was friendly, but it was hard to get the attention of the servers since they were fairly busy. Water (hot and cold) was never refilled until asked and no one made the rounds to see if we needed anything. 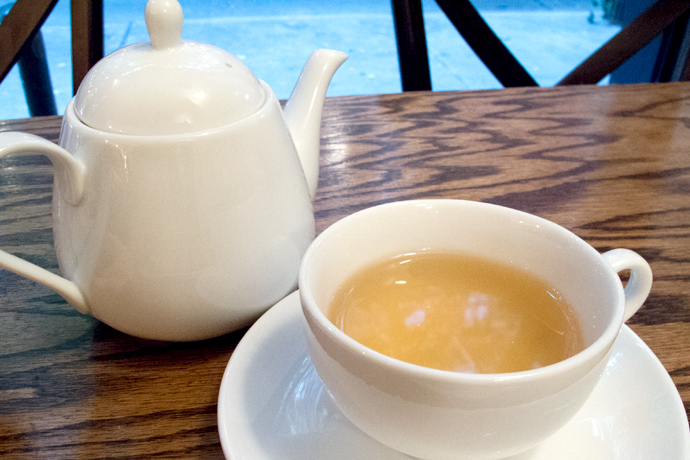 Excellent selection of teas — which totally makes sense since they are a tea parlor. The tea menu is extensive but not overwhelming. 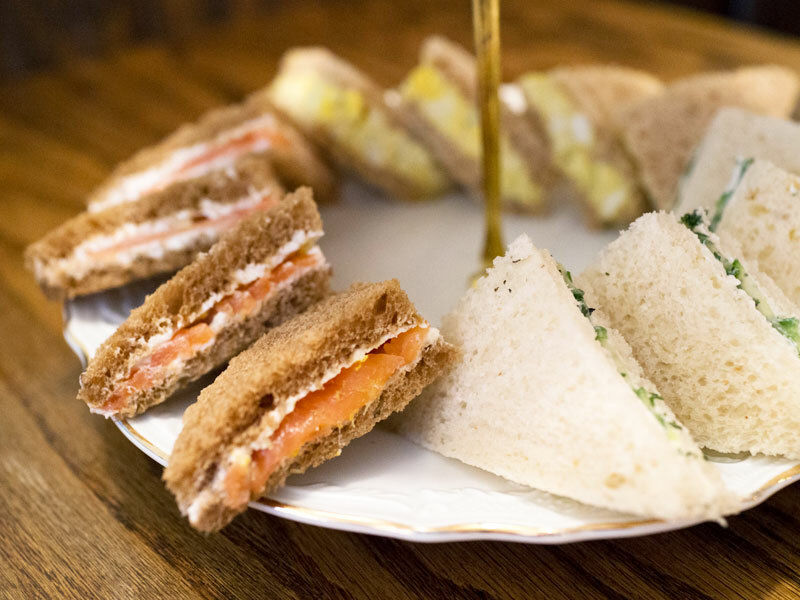 With the Bosie Tea Service, you get three tea sandwiches which you can choose from a list of six. Two of the tea sandwiches have an extra cost of $1. ALL CAPS RANT: WHY THE EXTRA CHARGE FOR CERTAIN TEA SANDWICHES??? I HATE IT WHEN PLACES NICKLE AND DIME. 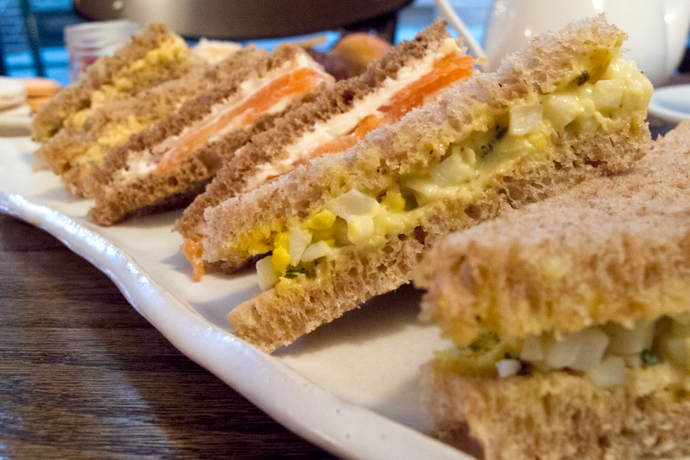 The tea sandwiches are nice and simple but they do range in quality. I’ve gone when they tasted a bit stale but I’ve also had them when they tasted freshly made so it’s a bit of a hit of miss. Each person gets two scones and they’re a lovely golden brown although they’re triangular in shape instead of the traditional round. 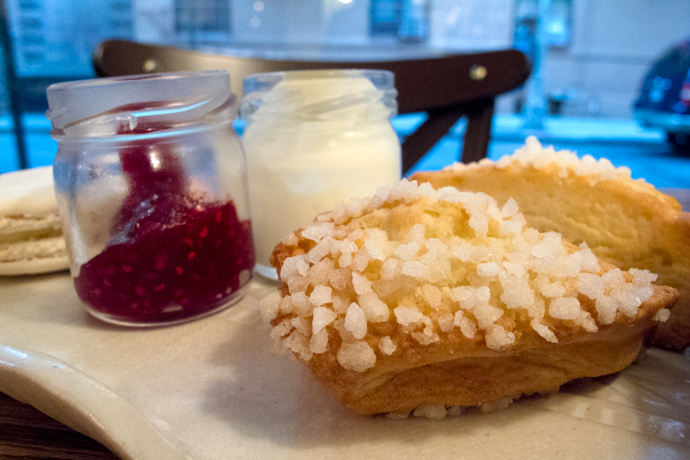 We got one clotted cream and one jam for the two of us which was not enough. I had to ask for another set, but wished they had given a set each of these super cute jars to begin with. Tea cakes and macarons make up the last course. We got to pick which macarons we wanted. I would have preferred more variety since two tea cakes per person got to be a little much. The afternoon tea is great for the price. 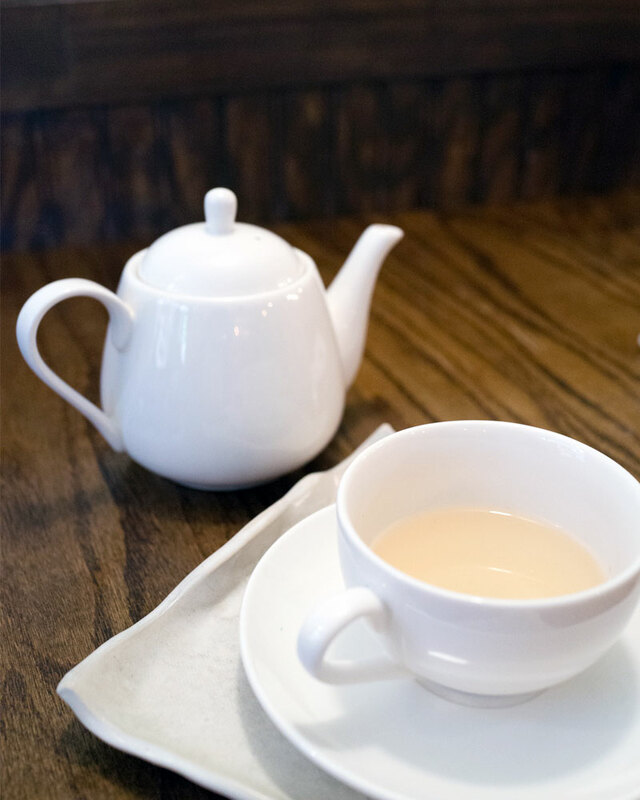 If you’re looking for an entry level tea service, this would be a good place to start. In 2012, the afternoon tea for two was $51. It’s now $66 although the food served are exactly the same. but the courses were served on rectangular plates instead of on a three tier tray as it is today. Tea sandwiches all on one plate. And the second plate had the scones with clotted cream and jam. Next to the scones were the tea cakes and the macarons. Cute.